Keet Dailey, a senior studying Kinesiology and an Operations staff member at Rec Sports, demonstrates the qualities of an exceptional athlete. He trains hard to compete as a triathlete and to better himself with each race. However, what sets him apart from the competition is his outstanding displays of sportsmanship. 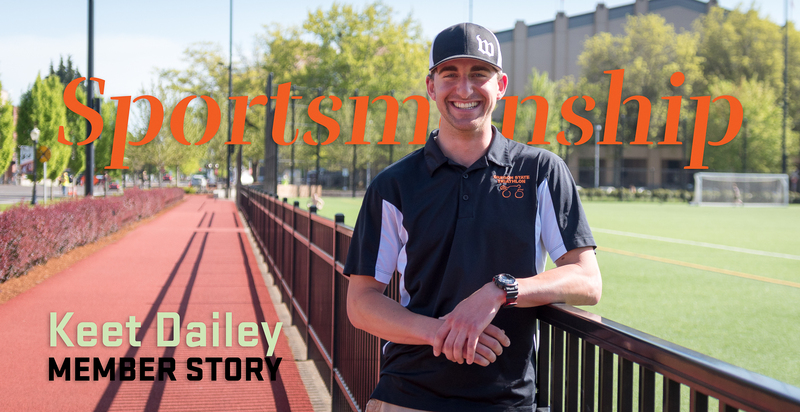 In 2013, during his freshman year of college, Dailey joined the OSU Triathlon Club after having a general interest in the sport. “A triathlon is a race that has three disciplines to it where you swim, you bike, and you run, and in between each discipline, you transition,” he said, “It’s a nonstop race and you go until you finish.” Since beginning the strenuous and competitive sport, Dailey has conquered many obstacles in the face of adversity. At the 2017 Collegiate Nationals on April 22nd, Dailey faced another career high moment during the Olympic-Distance National Championship triathlon. It was a hot and humid day in Tuscaloosa, Alabama, making an already challenging race that much more difficult. As Dailey began picking up his pace during the last quarter mile of the run portion of the event, he rounded the final corner to find Grant Schroeder, a competitor from UC Berkeley, who was clearly in distress from the conditions. “My first instinct was ‘this guy needs help’ and it’s just my natural instinct to help people,” said Dailey, “Getting him across the finish line was at that point in the race, my biggest goal. It didn’t matter about placing anymore or time; I just wanted to get him to the finish line.” Despite feeling exhaustion himself, he lifted Schroeder and continued moving toward the finish line. Another competitor, Spencer Ralston of Saint Michael’s College, noticed the pair in distress and jumped in to help. “I was lucky Spencer came along and helped us out because we really needed help to get Grant to the finishing line,” Dailey said, “He really wasn’t able to run or walk so we were literally dragging him.” At this point Schroeder was unable to move his legs and was doing all he could to remain conscious. “It’s definitely one of those things that I’d never experienced in my entire life,” said Dailey, “People are always cheering at the finish line because it’s just a really exciting moment finishing off Collegiate Nationals and you’re racing against the best in the country, but never have I ever heard a crowd being as loud as they were.” In awe of the exceptional sportsmanship happening before their eyes, the crowd rallied the three competitors as they crossed the finish line. Schroeder then received medical attention to counter his severe exhaustion and 107 degree fever. Get inolved, join a Sport Club today!